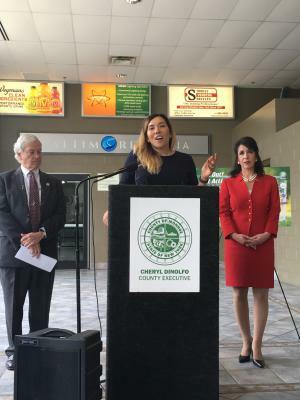 County Executive Cheryl Dinolfo today joined Don Jeffries, President of Visit Rochester, Olympic Fencer Iris Zimmermann and representatives from the Monroe County Sports Commission to announce a Monroe County Girls Sports Festival. The Festival is a half-day athletic event in which young women ages 6-12 have the opportunity to try a variety of traditional, as well as up-and-coming, non-traditional sports. Monroe County will host the Festival in conjunction with Visit Rochester and the Monroe County Sports Commission. Festival participants will be able to choose four different sports to explore. Local teams and organizations will manage each of the sports and participants are welcome to select any four available sports, but are also encouraged to try a sport they have never experienced before. In addition to traditional sports like volleyball, gymnastics and field hockey, participants will also have the opportunity to try non-traditional sports like disc golf, ultimate frisbee, sport stacking, Quidditch and fencing. The Festival will be held on Saturday, August 5th from 12:00 p.m. to 5:00 p.m. at the Bill Gray’s Regional Iceplex. Outdoor sports will be held adjacent to the Iceplex on the athletic fields at Monroe Community College (MCC). Registration costs $20 and participants receive healthy snacks and refreshments, a Festival t-shirt and a souvenir bag from the participating clubs.